Spaghetti pie before it goes in the oven. I’m the first to admit that I’m not a good cook but this recipe usually turns out pretty good. It’s based on what my mom made when I was a kid. I’ve made it the “normal” way (in a pie dish for like 6-8 servings) and I’ve made it for a group of about 12 in a 13×9 pan. The pie dish form is easier and turns out better. Next time I make for a group, I think I’ll just make more than one pie. This dish is great for company or just the family. While I wouldn’t consider it “health food,” it is relatively healthy and good for a winter night. It’s also easy for the holidays! While meat is browning, cook the spaghetti until it’s soft (like you would if you were making regular spaghetti. I like to use the “throw the spaghetti against the wall to test doneness” method but that’s just because I’m weird). 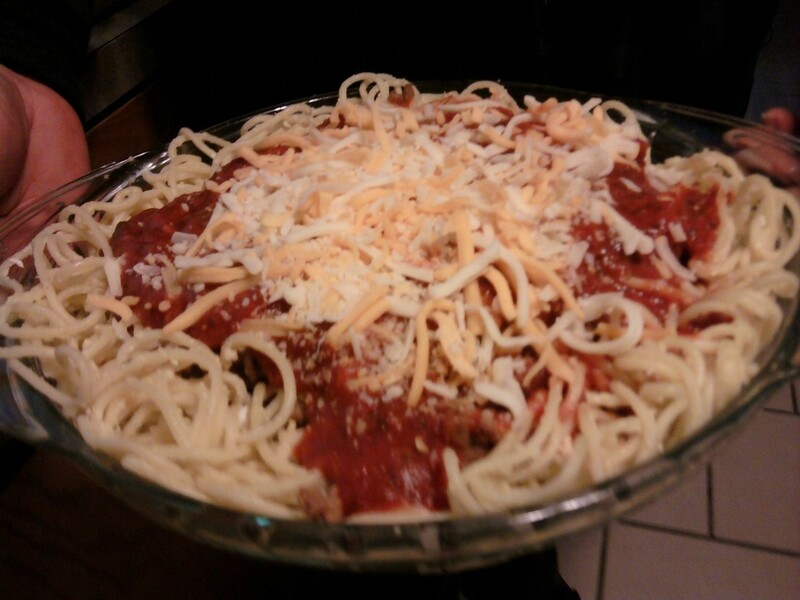 Place the spaghetti mixture in the standard size pie dish (I prefer to use Pyrex) and shape into the shape of a crust. with spaghetti coming up the sides, etc. Then comes the meat. Spread it over the cottage/ricotta cheese. Pour the sauce over the meat until it’s all covered (but leave the rims of the spaghetti on the sides uncovered just like a pie crust). By this time, the whole pie might be getting a little tall. If that’s the case, “smoosh” it down slightly with a spatula or large spoon (whatever you’re using to place all the other items in the pie is fine as long as a critical or picky person isn’t standing there watching). The final step is to cover the sauce, etc. with the shredded cheese. I would suggest not getting the cheese on the spaghetti crust because it will just get brown and crunchy. Kids especially find that gross. Carefully place the pie in the oven on a center rack. NOTE: if you use Pyrex, you should be able to place the pie in the oven by it’s self. If you use one of those aluminum pie pans or an aluminum disposable cake pan (for a larger dish), DO NOT place it in there by itself as it’s so heavy at this point it will collapse and you will have a mess that children and cats (and I’m sure dogs) will attempt to “help” you clean up. It will also probably encourage you to swear. Place the aluminum dish on a baking sheet to stabilize…it makes all things go much happier. Here’s the part where I feel a little dumb. I can never remember how long I bake it for. I know it’s longer than 30 minutes, but not sure if it’s 45. Really, it kinda depends on your oven and how it bakes. I usually set my timer for 30 minutes then check it. The cheese needs to be fully melted and the exposed spaghetti needs to be slightly crunchy but not hard in appearance. Another good test is to use a meat thermometer. I usually try for 360 degrees internal temperature but I don’t consider it a health issue because all the stuff that needs to be cooked before consumption was cooked before baking anyways. Carefully remove the finished pie from the oven (two hands, with oven mitts … not thin towels…are recommended). Cut like a regular pie and enjoy! I think it’s good with parmesan cheese sprinkled on each piece. It’s good with bread on the side. I like it with just about any vegetable, but my favorite is probably green beans. Something non spicy or heavy because this is a pretty heavy dish. I just wanted to let you know that I am still making this dish a year after I found your recipe on the blog 🙂 It’s delicious, easy to make, and John loves it! I’m glad you like it! My mom used to make it with the left over spaghetti (she’d make extra) and I’ve always loved it.